One of the fastest growing employment segments is the independent business consultant sector. Standing out from the crowd is becoming more and more difficult. A professional online presentation could be just what you need to illustrate to potential clients what you could do for their company. A simple online photo album or a case study is helpful for prospective clients. An online presentation with your voice explaining the nuances of each element will blow their socks off. The online presentation is the up-and-coming communication tool that can take your consultancy to the next level. Potential clients need to get to know a consultant before they hire them. A web site, with its static images and written words, often fails to communicate who you are. With NetXpression pictures, sales copy, case studies, etc. come alive with sound and movement. Your web site could speak in a new and meaningful way. Each one of your offerings—business consultancy, marketing collateral, advice, e-commerce, etc.—could be a new presentation using your voice or a video clip. This kind of communication is light years beyond a simple web site or static brochures. More and more consultants are using electronic newsletters to communicate with customers on a regular basis. They are very effective at building goodwill with potential and existing clients. However, because so many consultants are using this strategy, it is becoming less and less effective. The online presentation is the next generation of ongoing communication with customers. Use NetXpression to create animated and personal online presentations to build customer relationships and stay ahead of the curve. 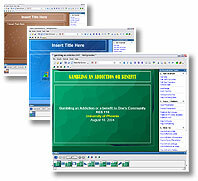 Once you become proficient in creating presentations for yourself, creating them for your clients is very easy. Purchase and download NetXpression now and you could have a presentation up on your web site in a few minutes from now. You can also create an unlimited number of presentations for the one-time investment. In other words, you could be creating stunning online presentation for years to come without spending one more penny.